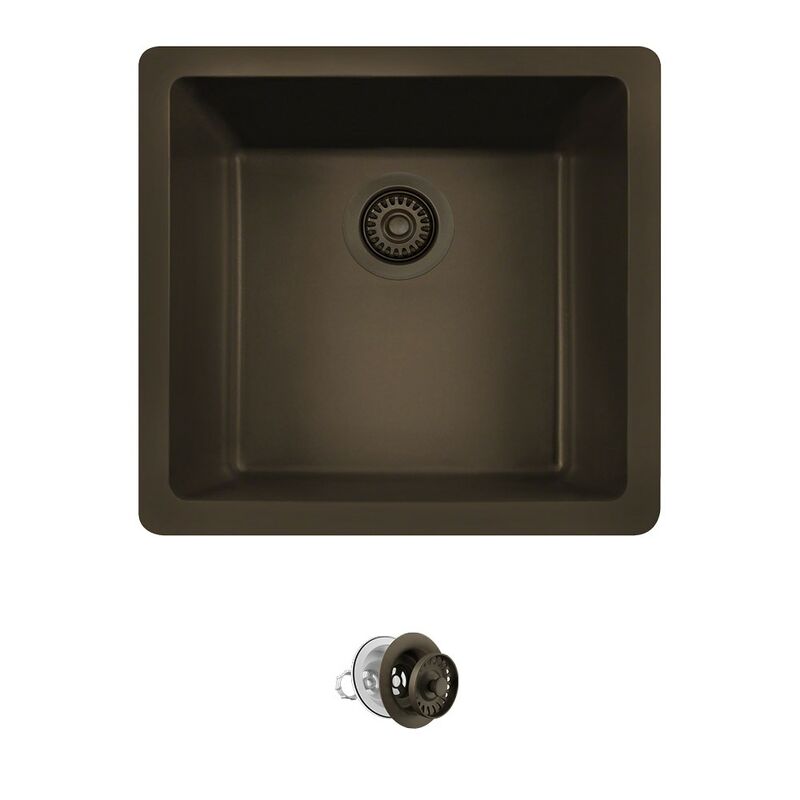 The MR Direct 805-Mocha sink, a rich chocolaty-colored model, has numerous exciting features; not the least of which is its TruGranite composition. A balance of 80% quartzite and 20% acrylic, which is additionally infused with silver ions, makes for a very dense, nearly impervious substance with a very attractive, satiny-smooth appearance. It is nearly impossible to scratch or stain because of its density, and it can withstand extreme temperatures - a dropped knife will not scratch, acidic foods will not stain, and hot pots will not burn the surface. No sound-dampening pads are required because TruGranite is inherently quiet. The 805-Mocha model is a dualmount design, offering the option of being installed over or below the countertop. It is a smaller-sized sink, offering a nearly square, single-bowl design of modest depth; making it a perfect fit for kitchens with limited space. With an overall measurement of 17 3/4" x 16 7/8" x 7 3/4", it will require a minimum-width cabinet of 18". It is cUPC certified. One matching, mocha flange rests over the garbage disposal and becomes the visible portion of the drain system below. When necessary, its stopper can be positioned to prevent waste or water from going down the drain.